But I just want to run a Hadoop job? Tasks are where the execution takes place. Tasks depend on each other and output targets. In this case, the DailyReport task depends on two inputs created earlier, one of which is the same class. requires can return other Tasks in any way wrapped up within dicts/lists/tuples/etc. Sometimes you might not know exactly what other tasks to depend on until runtime. In that case, Luigi provides a mechanism to specify dynamic dependencies. If you yield another Task in the Task.run method, the current task will be suspended and the other task will be run. You can also yield a list of tasks. This mechanism is an alternative to Task.requires in case you are not able to build up the full dependency graph before running the task. It does come with some constraints: the Task.run method will resume from scratch each time a new task is yielded. In other words, you should make sure your Task.run method is idempotent. 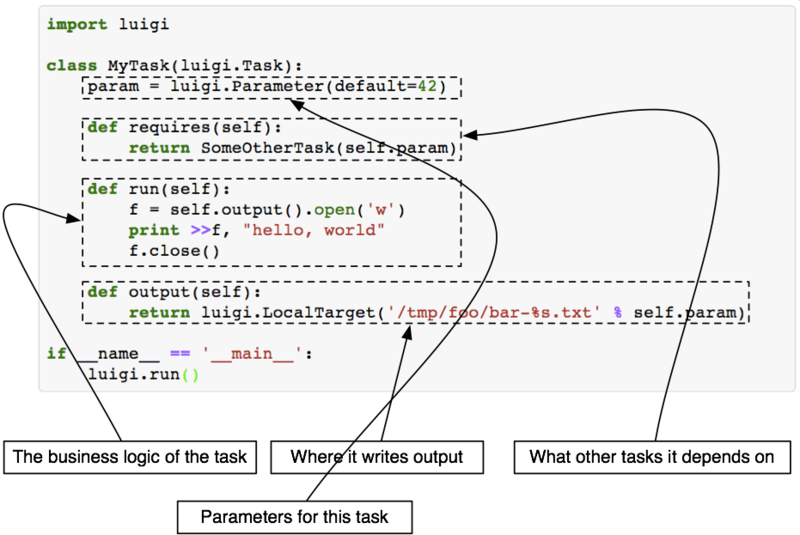 (This is good practice for all Tasks in Luigi, but especially so for tasks with dynamic dependencies). For an example of a workflow using dynamic dependencies, see examples/dynamic_requirements.py. Luigi has a built-in event system that allows you to register callbacks to events and trigger them from your own tasks. You can both hook into some pre-defined events and create your own. Each event handle is tied to a Task class and will be triggered only from that class or a subclass of it. This allows you to effortlessly subscribe to events only from a specific class (e.g. for hadoop jobs). The scheduler decides which task to run next from the set of all tasks that have all their dependencies met. By default, this choice is pretty arbitrary, which is fine for most workflows and situations. Tasks with a higher priority value will be picked before tasks with a lower priority value. There is no predefined range of priorities, you can choose whatever (int or float) values you want to use. The default value is 0. 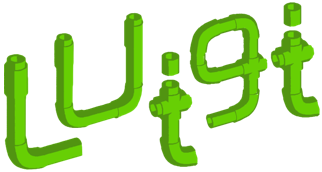 Warning: task execution order in Luigi is influenced by both dependencies and priorities, but in Luigi dependencies come first. For example: if there is a task A with priority 1000 but still with unmet dependencies and a task B with priority 1 without any pending dependencies, task B will be picked first. In order to avoid name clashes and to be able to have an identifier for tasks, Luigi introduces the concepts task_namespace, task_family and task_id. The namespace and family operate on class level meanwhile the task id only exists on instance level. The concepts are best illustrated using code. The full documentation for this machinery exists in the task module.